The Body Politic: A Stalinst themed Australia Day? On 24 November 2007, the Australian Body Politic had a Heart/Brain transplant. So far, it seems the patient is making a good recovery, but we shall monitor progress. As of 31 December 2007, the patient has been moved out of "Intensive Care". There was a period of uncertainty, under Kevin Rudd, and then Julia Gillard. On 14 September 2010 Julia Gillard was sworn in as Prime Minister, by the Governor General. A Stalinst themed Australia Day? My friend Dion has sparked a controversy by writing to the Australia Day Council Secretariat to object to the Stalinist-style imagery used in their advertisement for this coming Australia Day. Tam Johnston, National Program Director, National Australia Day Council briefly considered Dion's comments, but did not agree with him. 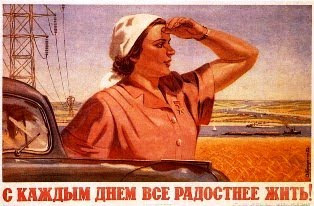 I think she did not understand the reference to the tradition of Stalinist Poster Art. 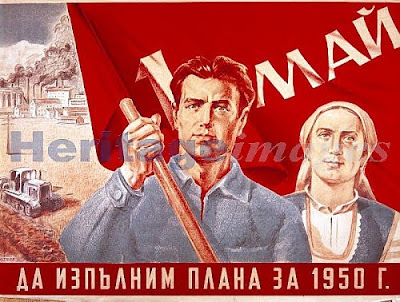 are derivative of (or alternatively a tribute to) Soviet Poster Art of the Stalinist era. That was the point which Dion originally alluded to in his original email - although he did not spell it out. Clearly he did not think it necessary. The reference to "Stalinist" style in his email ought have been enough. Sadly that was not the case, apparently. 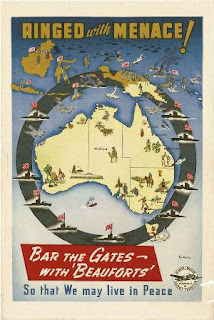 Ms Johnston replied that the Australia Day advertising: "is designed to be a somewhat whimsical reference to Australia’s own World War II advertising." In my opinion, that reply is is simplistic and ill-informed. 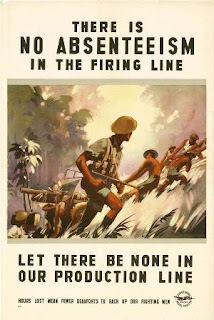 Australian WW2 posters were not at all in that style. 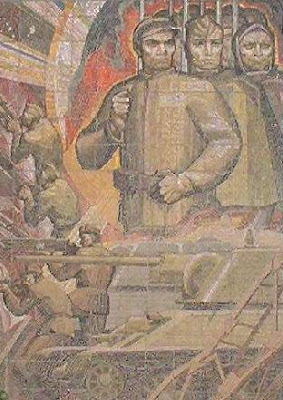 I am sure that if the Australia Day Secretariat had bothered to consult the Art experts at the Australian War Memorial they would confirm this impression. 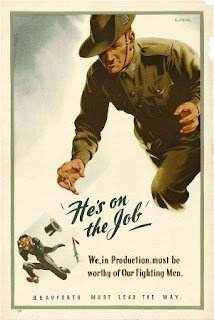 Here are some examples of real Australian World War Two advertisements, courtesy of the National Archives of Australia. An Aussie "Digger" chasing a diminutive enemy figure in a "Top Hat". These are real advertisements from Australia's WW11 period. Not whatever fantasy images the Australia Day Secretariat, or its artist, imagines were used. Ultra-realism, not stylised symbolic images looking to the "future". I was sufficiently annoyed by the apparent ignorance of the Australia Day Secretariat staff, that I have tonight written back to Ms Johnston pointing out that the symbolism of the imagery in their advertisement is completely off the mark. 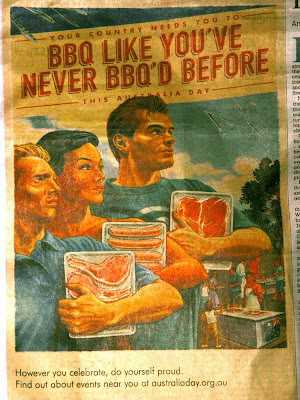 Furthermore, as Dion pointed out in his original email comments to the Australia Day Council, the use of meat, including pork chops in the advertisement is divisive, within the modern Australian Community. Ms Johnston did not address those points in her facile reply. So tonight, with regard to the Australia Day advertising, I have asked her specifically, what about vegetarians and Vegans? What about observers of Islamic and Judaic dietary codes? Surely these advertisements are non-inclusive, if not downright divisive. I have suggested that the Australia Day Council withdraw this advertisement. REMEMBER: "IT IS BY BEING QUIET AND POLITE CITIZENS WE ALLOW OURSELVES TO BE IGNORED"
Fw: Open Letter to the NSW Premier, Ms Keneally.